The Daily Sketches provided here at Stickers 'N' Fun provide an abundance of ideas to help inspire your scrapbooking pages. This layout shows you how to take a sketch, adapt it to your photos and make it your own. This layout was created using four papers from the Chatterbox Powder Room Paper collection (Powder Scarlet Puffs Paper, Mini Powder Puffs Paper, Powder Lollipop Stripe Paper and Powder Bubbles Paper), pink cardstock, light pink ink, dark pink ink, brown pen, small circle punch and Creative Imaginations Epoxy Flower Alphabet stickers. To recreate this layout, follow the sketch. Begin with your background. As you can see, the background is comprised four rectangular pieces with a small gap between each. Set aside your pink cardstock for the background. Now select two matching patterned papers. I have used Chatterbox Powder Scarlet Puffs Paper and Chatterbox Mini Powder Puffs Paper. Cut two rectangles of Chatterbox Powder Scarlet Puffs Paper for the top left-hand corner (it should measure approximately 10.2cm by 8.4cm) and the bottom right-hand corner (it should measure approximately 19.4cm by 21.3cm). Cut two rectangles of Chatterbox Mini Powder Puffs Paper for the bottom left-hand corner (it should measure approximately 10.2cm by 21.3cm) and the top right-hand corner (it should measure approximately 19.4cm by 8.4cm). Position your rectangles on your pink cardstock. Arrange them as shown in the sketch, remembering to leave a gap between each piece. If you like, you can position them right up against the outside edges of your pink cardstock, as in the sketch, or you can also leave a gap around the edges as in the layout. This is a matter of personal preference and gives you an opportunity to adapt the sketch to suit you. Now that you have completed your background, it is time to move onto the next level. As you can see from the sketch, the next stage is your two photo mats - one horizontal and one vertical. Crop your photos and mat on pink cardstock. This is another opportunity for you to vary from the sketch. The sketch indicates a single thin mat, but you can use any type of mat you like. 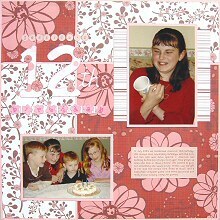 For example, this layout uses the thin pink mat for both photos. However, a piece of Chatterbox Powder Lollipop Stripe Paper measuring approximately 13.4cm by 12.8cm has been placed behind the vertical photo to give it extra emphasis. The edges of the stripe paper have also been inked with light pink ink to help it stand out from the background. When you are happy with your photo mats, adhere them to your background as shown in the sketch. As you can see in the sketch, the title goes in the top left-hand corner, across the gaps between your patterned paper. You can create your title any way you want - alphabet stickers, die-cuts, stamps, etc. The choice is yours. To create the title shown in the layout, divide your chosen title into three segments (one for line 1, one for line 2 and one for line 3). Begin with line 2 (in this case '12th'). Using fonts from your computer or an alphabet template, cut two large numbers from Chatterbox Powder Bubbles Paper and ink the edges with dark pink ink. Repeat this process with a smaller font to create the 'th'. Position on your page and adhere. Embellish this section of your title with flowers cut out from the Chatterbox Powder Scarlet Puffs Paper. To create line 1 (in this case 'Jessica's'), punch out small circles from Chatterbox Powder Bubbles Paper. Make sure you have one for each letter of this part of your title. Turn them over and use the pink underside. Lightly ink the edges with light pink ink and, using a brown pen, write a letter in the centre of each to make up your word. Position them in a line above the large numbers and adhere. Cut a strip of Chatterbox Powder Lollipop Stripe Paper measuring approximately 12.5cm by 1cm. Ink the edges with light pink ink and adhere under the large numbers on your page. Use Creative Imaginations Epoxy Flower Alphabet stickers to create the last segment of your title (in this case 'birthday') on top of this strip. You may like to place the stickers on white cardstock and cut them out first as they are fairly transparent. If you don't have these stickers, a similar effect could be created with a flower punch, pink cardstock and a pink pen. Finish off your page by placing your journaling in the bottom right-hand corner of your page. You may choose to journal directly on your background, but in this case, the background is quite dark. For easier reading, journaling has instead been placed on a stripe of Chatterbox Powder Bubbles Paper. You can use either side, but the pink underside has been used here. Sketches help make the design process of a page much easier and quicker while still allowing you the creative flexibility to create the look you want. Play around with them and have some fun. And don't forget, we have a new one for you every day on our main page. Collect them all!